SPYSHOTS: Nissan Versa sedan – next Almera seen? Here’s our first look at the forthcoming next-generation Nissan Versa sedan, which could form the basis of the next Asian-market Almera that could also be for Malaysia in due course. Our spy photographers have captured the test vehicle running road trials in the United States, albeit in heavily disguised form. The forthcoming B-segment sedan appears to draw more than a passing resemblance to the year-old Altima, with a more horizontally oriented set of headlamps compared to the more vertical items on the current car. Behind the camouflage foil is a suggestion of the full-height V-motion grille as seen on the Altima, which would be a natural progression for a family look approach that is often adopted across brands. Its early days in terms of determining what’s under the hood, though the current US-market Versa employs a 1.6 litre HR16DE naturally-aspirated engine that is mated to either a five-speed manual, four-speed auto or continuously variable transmission (CVT) driving the front wheels; the Malaysian-market Almera uses a 1.5 litre HR15DE engine. Inside the test vehicle appears to be a version of the NissanConnect infotainment system with touchscreen display, while its steering wheel also appears to be of the latest with a smaller centre boss/airbag housing. Eventual specification is yet to be disclosed, though the visually similar unit in the Altima supports Apple CarPlay, Android Auto, Siri and Google Assistant, as well as over-the-air updates, door-to-door navigation and real-time traffic information. Should the forthcoming Versa translate into a more Asia-specific version, expect minor aesthetic and equipment changes. The Versa currently gets six airbags and Vehicle Dynamic Control (VDC), features that are missing on the local Almera; a camera at the top of the windscreen suggests that autonomous emergency braking (AEB) will be added on the new model as well. The post SPYSHOTS: Nissan Versa sedan – next Almera seen? appeared first on Paul Tan's Automotive News. 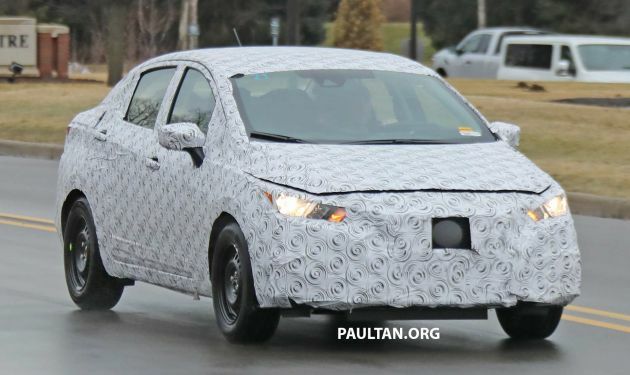 0 Response to "SPYSHOTS: Nissan Versa sedan – next Almera seen?"